Big rig plunges onto I-95 in Bucks County. Walter Perez reports during Action News at Noon on April 10, 2018. 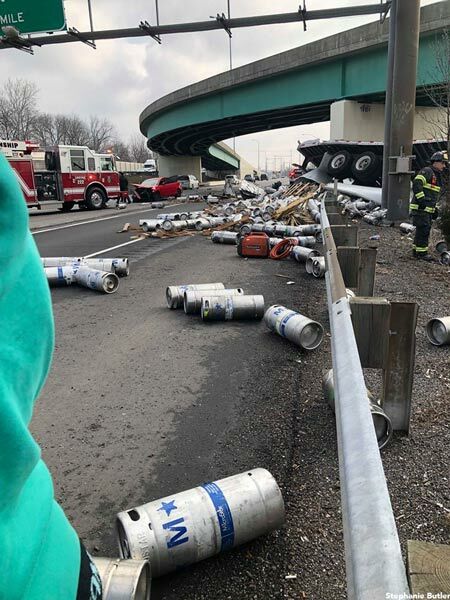 BENSALEM, Pa. -- An 18-wheeler carrying kegs exiting I-95 south lost control on an overpass and plunged onto the northbound lanes in Bensalem, Bucks County. It happened around 9 a.m. Tuesday. Major tractor-trailer crash on I-95: Matt O'Donnell reports breaking news on 6abc at 9:50 a.m. on April 10, 2018. The only other vehicle involved was a car traveling north on 95 at the time. That vehicle slammed into the wreckage. Watch video from Chopper 6 over a tractor-trailer crash on I-95 in Bensalem on April 10, 2018. Amazingly, neither the tractor-trailer driver nor the person inside the car were seriously injured. But the crash left behind quite a mess. Empty beer kegs from the tractor-trailer were scattered all over the highway. State police were forced to shut down I-95 north for about an hour and a half as a result. Members of the cleanup crew tell Action News this job was challenging because the 18-wheeler ended up on a sloped embankment between the highway and the Park-and-Ride, about a mile south of Street Road.